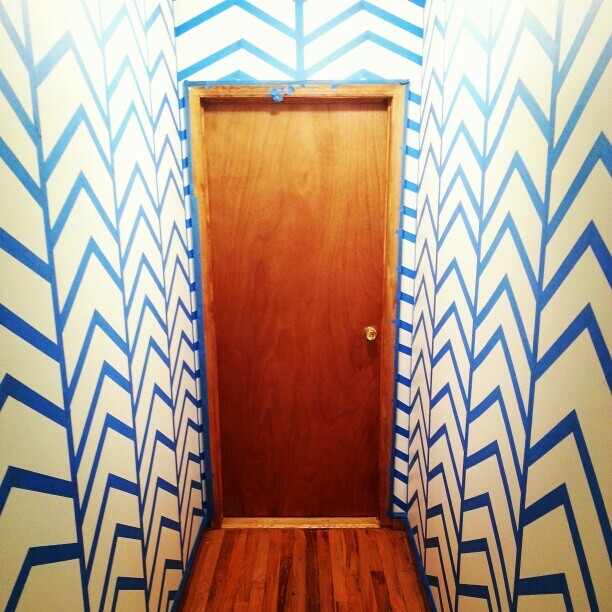 I decided to go all-out on the hallway and did this chevron pattern. STEP 1: Tape Tape Tape, I measured out the hall, and with 88″ It divided into 4 sections of 22″ and then sort of approximated the rest to work around the 4 doors in that hallway. Do the vertical stripes first, with a lazer level. To get the angle for the chevrons, you can use a drafting triangle, I used a 30/60 triangle, if you dont have one just take a piece of cardboard or paper and make yourself a guide. The great thing about this pattern is that you can do it all in one step. STEP 2: For the cleanest possible lines make sure to press the tape down hard at the edges! Use your nails, or use a small plastic putty knife. Do not skip this step! The whole project depends on the tape sticking! STEP 3: Paint it! I found the blue tape wrinkles a bit which is scary but the trick is just to power through, get it as covered as you can in a single coat before the paint soaks into the tape and wrinkles. Then touch up any places the wall color shows through with a paint brush. TIP: Keep your roller and brush as lightly coated as possible to avoid drips, keep rolling back and forth and up and down to get coverage. STEP 4: Wait for it to dry… then peel the tape and make a big ball of tape in the middle of the floor, or maybe smaller balls which the cats can chase until they get bothered by it sticking to their paws. STEP 5: Touch up any bleeds or missed spots, and then make yourself a drink. Color: Blue Dragon by Benjamin Moore. I love this…it’s almost too much, and that’s what’s perfect about it.